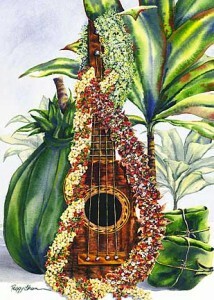 Peggy Chun is known in Hawaii for her beautiful and often whimsical paintings. 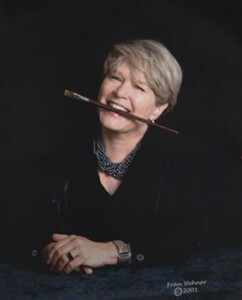 Her work can be found in both private and corporate collections across the globe. 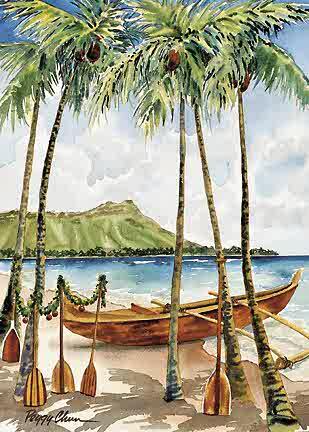 This watercolor artist, who lived the last years of her life paralyzed by ALS, or Lou Gehrig’s Disease, captured the “spirit of aloha” and thrived on sharing her love of the islands (and life!) with the world. Even through her six-year battle with ALS, Peggy continued to live a full and creative life, inspiring those around her with her courage, passion, and sense of humor in the face of adversity. Peggy died peacefully in her home on November 19th, 2008, surrounded by her friends, family, and famed group of caregivers, the “Peg’s Legs”.We will miss Peggy’s playful spirit, generous heart, inspiring courage, and “larger than life” presence, but her spirit lives on in her paintings and in our hearts. One sunny morning in 1992 the door to our office opened a fraction and a beaming face appeared: “Hi, I’m Peggy and I‘m an artist!” Peggy was on Maui visiting the Nona Beamer family, and she had come to Makawao to pick up some of the famous cream puffs at Komoda’s Bakery next door. This delightful introduction set the tone for our friendship and productive cooperation that followed over the years and continues to this day. At the time, Pacifica Island Art had just begun venturing into the publishing business and our staff consisted of two employees. The main tasks I had taken on – besides answering the phone, picking up the mail, accounting, packing & shipping, crawling into our “warehouse” under the rafters, and running errands – were product development and the distribution of our new line of greeting cards, consisting then of a total of twelve (!) styles. These responsibilities necessitated frequent visits to Oahu in order to open new accounts and to contact artists who were interested in licensing their work. The fondest memories I have of those trips are of my visits with Peggy. After a long, arduous day plying the trade of a salesman I would pick up Thai take-out food – Peggy’s favorite – and a bottle of Merlot, and make my way up the Pali. When I came to the plantation-era mansion in Nuuanu, it felt like I was entering a refuge. The house had been transformed into an artist’s abode: varied artwork covered the walls from floor to ceiling, papier-mâché sculptures and odd collections of interesting objects were displayed in the rooms. Creative chaos reigned supreme! Peggy and I would sit in the kitchen joined by Boo and Sarah, her feline friends, share the meal, talk story and, above all, laugh a lot. I always made sure not to miss the latest quotations and cartoons posted on the door of the fridge. And afterwards we would proceed to the attic, Peggy’s studio, and “work”. What great fun to toss around ideas and watch her blend watercolors, prepare sketches while she taught me some drawing techniques in the process. Peggy did not suffer from “Artist’s inflated ego syndrome” and encouraged everybody to enjoy artistic expression: “Dump your inner critic, Paint! Have fun! Lighten up!” It was during those sessions, with Boo curled up and purring on the very pad of paper, that concepts for some of her enduring images were formed that have found their way into many art collections and, in their humbler form as greeting cards, into the homes of people around the world. A paint brush in Peggy’s hand was an extension of her heart and her artwork reflects the spirit of Aloha, the playfulness, the whimsicalness, and the humor that are so alive in her character! Peggy Chun, Madame artiste extraordinaire, I love you and thank you – for your friendship, for the occasions when we shared our joys and sorrows, for letting me sleep on your couch! Thank you, too, for having chosen me as your publisher when bigger fish were soliciting you, and for your courage in the face of adversity. This entry was posted on Saturday, July 4th, 2009 at 12:57 am. 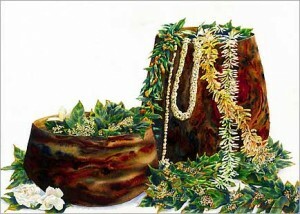 It is filed under Pacifica's Artists and tagged with a lei never forgotten, Aloha, aloha spirit, ALS, art prints, cats, Hawaii, hawaiian, hawaiian art prints, hawaiian artist, Hawaiian greeting card, Holiday greeting card, Holiday Greting Card, Keola Beamer, Kimi Chun, Lou Gehrig's disease, Mele Pua, nona Beamer, Peg's Legs, Peggy Chun, Peggy Chun Gallery, Surf Shack, watercolor painting, whimsical art. You can follow any responses to this entry through the RSS 2.0 feed. Aloha-have always visited Hawaii, truly felt home there….people, no where like it. Just wanted to acknowledged in receiving a “Thank you” card w/such a sincere prayer from my friend when I last visited Hawaii in November 2010. I had acknowledged who Peggy Chun right @ this moment, upon my friend giving me a card by this artist. Very nice…. So sorry to hear of Peggy’s passing. 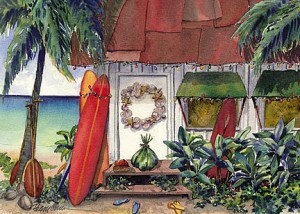 One of her prints have graced our wall for over 15 years and I still feel the Aloha Spirit when I walk past. Thank you Peggy.